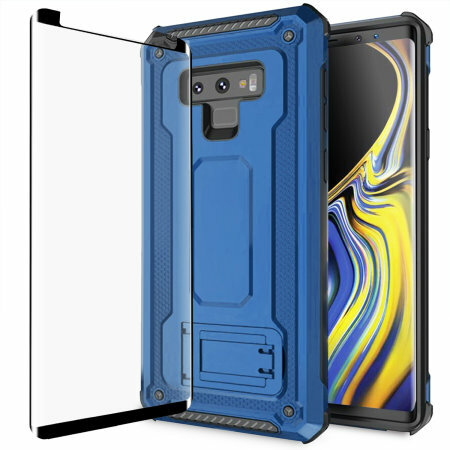 Equip your Galaxy Note 9 with a 360 degree protection with this new blue Olixar Manta case & glass screen protector bundle. Enjoy a built-in kickstand designed for media viewing, whilst also compliments the case's futuristic & rugged military design. Very nice looking, strong enough to protect my phone I like the extra arm to hold the phone in place well done. Will fit. But not for an aggressive environment. Arrived promptly.& did what it said on the tin! The screen protector was easy to install, however, small dots can be seen and reduced the quality of viewing significantly. This is not acceptable on a Note 9 display which features beautiful screen. I have ripped it off immediately and opted for the Whitestone Dome protector - it seems the only screen protector currently on the market that does not effect the quality of the screen. The cover was too bulky and made the note 9 very wide, making it difficult to hold in the hand. Further, the kickstand is too short and creates uncomfortable viewing angle. I now use Samsung's own case with kickstand which is more comfortable and provides a better angle when on kickstand. The price is great, but when it's not useable, it's just money down the drain. The case fits like a glove and has a real nice smooth touch style finish to it that as yet hasn't got slippery in warm hands. The glass screen fits perfect with a very small gap around the edge and the 3 sticky tabs help alignment perfectly. Buy with confidence!!! Glass screen very poor broke after 2 days! Glass screen cracked on side of phone - it was never dropped simply on a pocket inside my handbag. Better products are probably available. The case fits snuggly and all the buttons work. The stand works although the angle of the screen feels a little too flat for viewing media when it is deployed. The screen protector has never fit properly causing dead spots and poor sensitivity. Overall, pretty disappointing. Can you try the following instructions to see if this helps? Received my Note 9 after I bought the Olixar screen protector. Got the phone out and put it straight on the phone, didn't even turn it on. I followed what to do and watched your YouTube tutorial, but after doing it all later that night I put the Olixar Tough case on and it lifted the top and bottom of the screen protector so when typing it would just tap the screen and get dirt under the protector, the seal on it was rubbish, just felt there wasn't enough seal. It was only around the edge of screen protector. Can't fault mobile fun when contacted them, they helped resolve my issue, but I wouldn't recommend the screen protector.